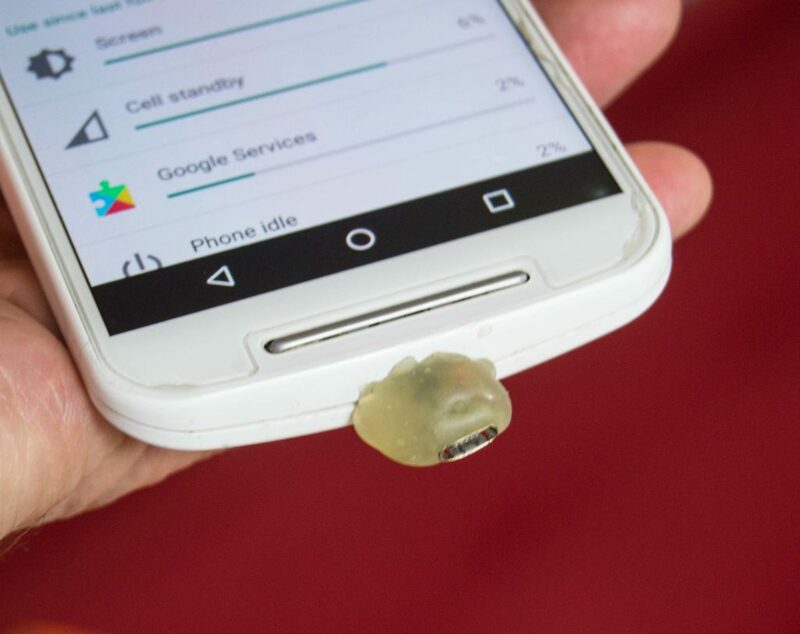 My 3.5-year-old MOTO G phone is aging exponentially. In those 3.5 years, my average yearly cost for purchase and plan has been under $300. You get what you pay for, and the phone limits what I can do with it. For the most part, that’s a desirable feature, but I sometimes think about having enough memory for more than two apps. 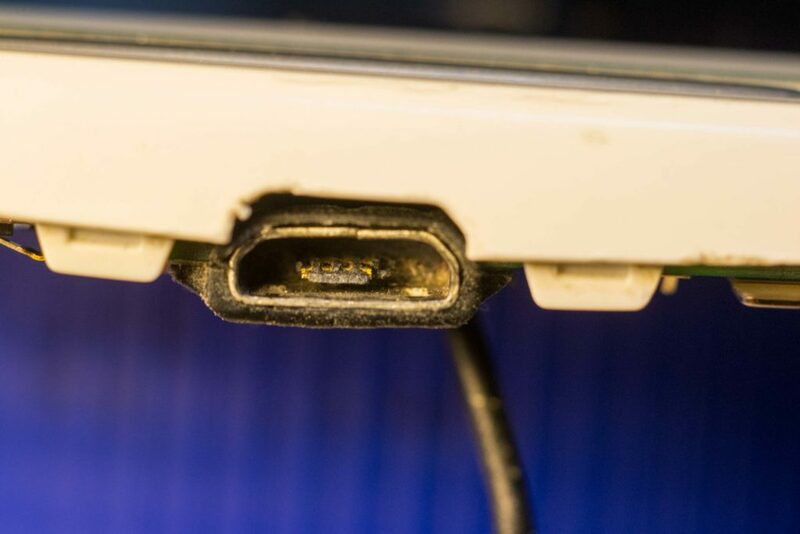 The micro USB port should have five contacts. One of mine went missing (the one on the right). The phone would not charge. Will tells me these ports are rated for 5000 insertions, but I didn’t get very close to 2000. The phone seemed normal yesterday morning, but the battery was dead by midday and it would not charge. 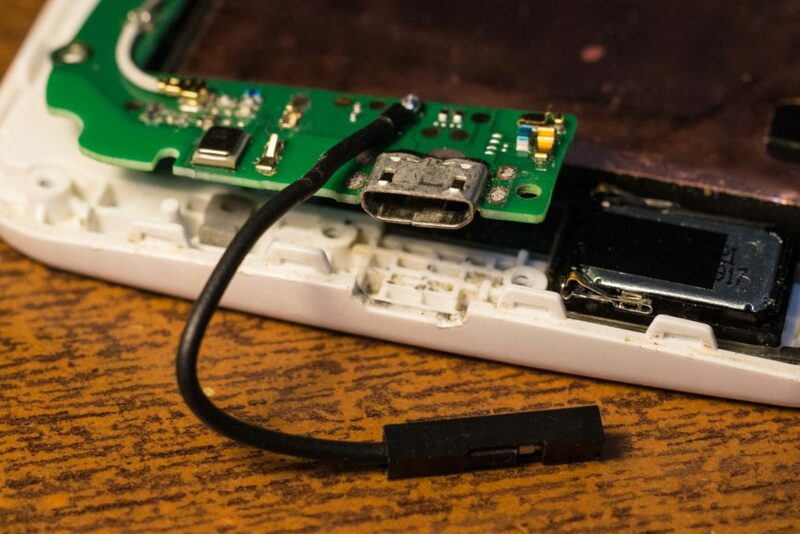 The reason was that the micro USB port broke. Contact number 1 which is the 5 volt line was completely missing. Spending even $30 on a repair was a poor investment, so I started thinking about a new phone that had room for three or four apps. A Torx #6 driver is all you need to expose the PCB that the USB port is mounted on. I couldn’t retrieve anything from the old phone because I could not turn it on. That seemed okay except for some recent photos I had taken. 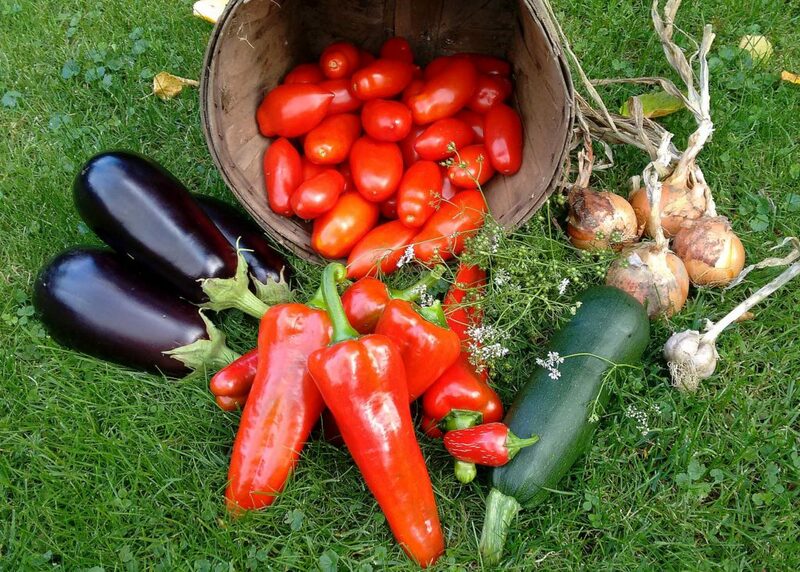 Fortunately, the camera on the phone is horrible, so the photos were not worth much, except that they were of the peak luscious harvest from the vegetable garden. With nothing to lose, I decided to bypass the missing pin in the USB port so I could charge the phone and retrieve those photos. I found a solder pad that seemed to be connected to contact 1 in the USB port and soldered a connector to it. With a separate connector for the 5 volt line, I had to modify a charging cable so I could run one wire from the cable to the connector, but that was easy. 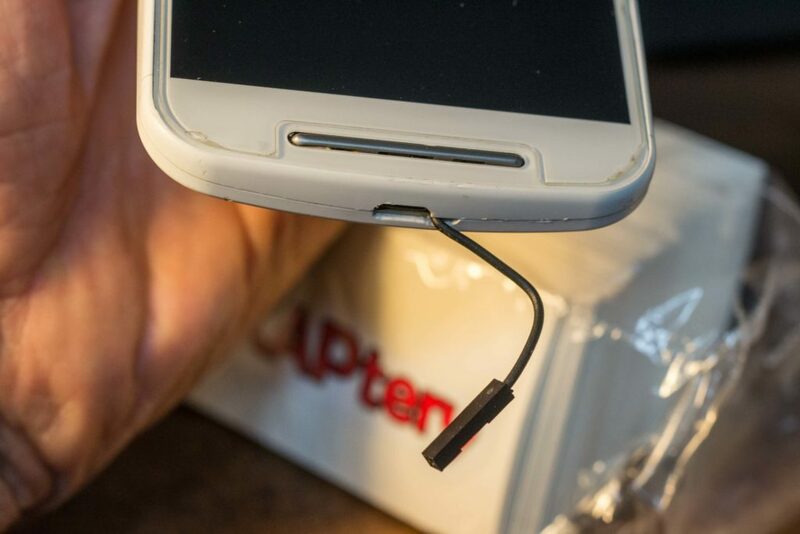 This modified charging cable is the only one that will charge my phone now. I like the new tail on my phone. Thanks to solder, everyone can now see the ingredients for ratatouille. 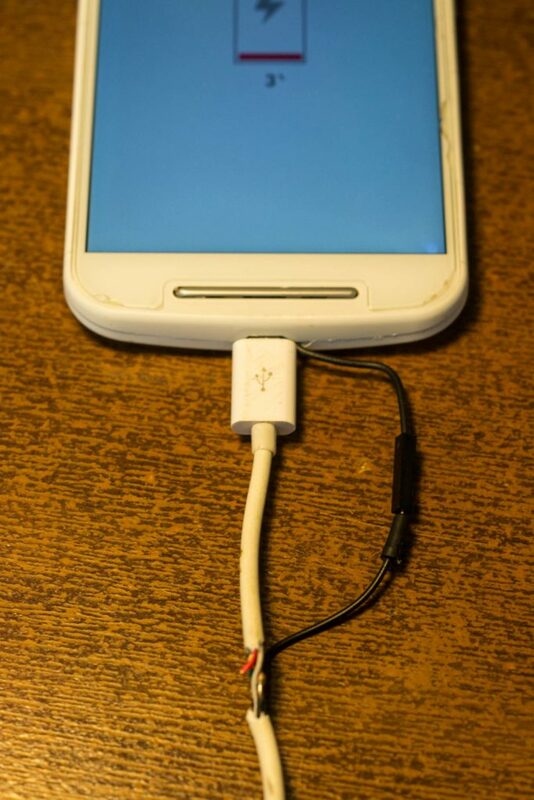 I’m glad I could rescue the veggie photos from the phone, but charging the phone now requires my modified cable. So I guess I’m suddenly a lot closer to upgrading from my trusty $150 phone to a shiny $200 phone. It was certainly inconvenient that I could charge the phone only with my modified charging cable, so I ordered some micro USB ports (10 for $1.00 on eBay). I didn’t try to remove the old one and properly replace it because I doubted I could do that successfully. But it was easy to connect a new USB port to wires from ground and power. I strengthened the new port with hot glue and it works like new. Now I can charge again like an apparently normal person. 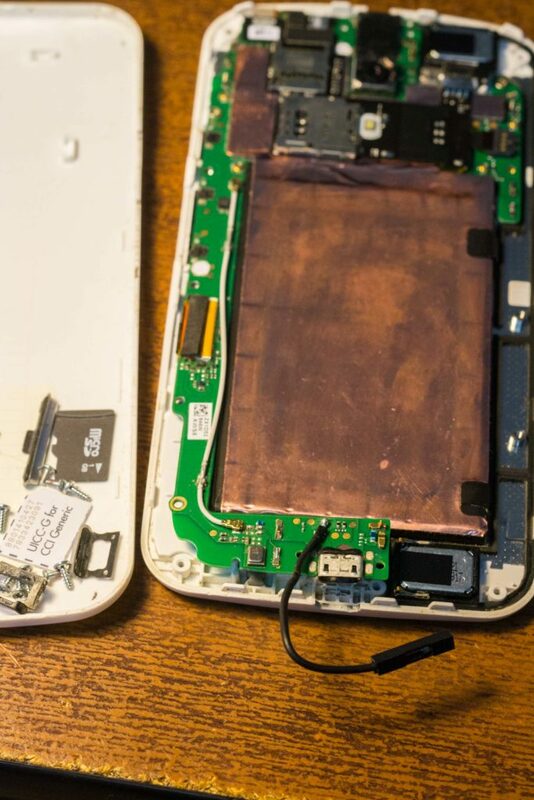 The new charging port elicits almost as much curiosity as the old exposed wire. A life of three and a half years is not bad, especially with the original battery. I think phones are designed to last two, so anything above that is gravy.